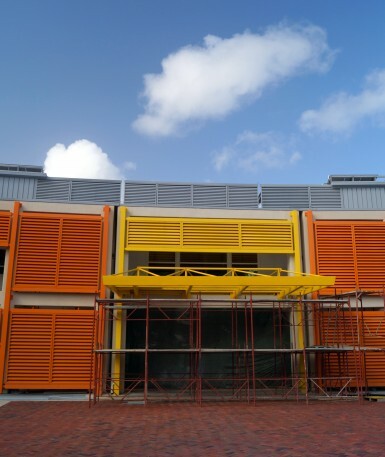 Trade Winds channelled through Saint Lucia New National Hospital for natural ventilation—World Architectural News reports. The Saint Lucia New National Hospital (SLNNH) is a monumental endeavor by many measures: for the Government of this Southern Caribbean island nation it is an investment replacing a near 100 year old institution and anchoring the Health Care system; for the European Union (EU) it is the single largest endeavor in cooperative development in the Americas; for the regional consultants partnering the European designers (Sir Frederick Snow and Partners Ltd (UK)) it is a seminal opportunity. The local consultant team, lead by architects Michael L. St. Hill Architects & Planners Ltd (previously Tropical Architecture Group (St. Lucia)) joined at the beginning of the construction phase. There were immediate challenges with the early discovery that recent construction, completed after the original design, necessitated the remodeling of the site. This was turned to a feature with the introduction of monumental steps sweeping down to the building. The architects have used colour to great effect; borrowing from the rich hues of the local stone to make the long front facade into a broad smile. 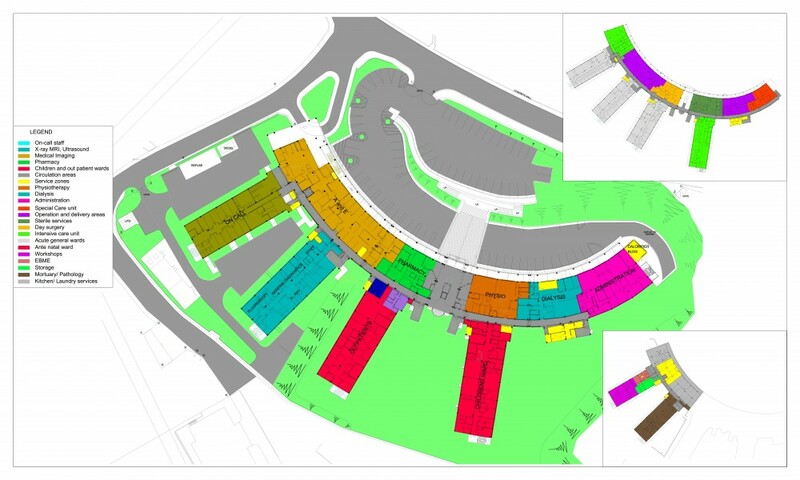 Inside, levels and sections are colour coded to orientate and give comfort, a sense of place and even of home to staff, visitors and, ultimately, patients. The design adopts a simple parti: the body of the building a curve of technical, ‘serving’ areas (Surgeries, Dialysis and Physiotherapy Suites) springing wings of ‘served’ spaces – mostly wards. The hospital is set on a hillside overlooking the Caribbean Sea; ideal for rest and recuperation and for a relatively low tech, passive and economical approach to sustainable energy design. Wards in the wings are without active air conditioning, relying on channeling the Trade Winds through the configuration of windows and bris soleil. A constant challenge for the design team of Sir Frederick Snow and Partners and Michael L. St. Hill Architects was technology and ‘construction culture’ transfer. Ultimately the demands of 21st Century hospital standards of performance and design are rigorously maintained. The SLNNH has 120 beds, Maternity and Delivery Suites, 2 Operating Theaters and Day Surgery, Dialysis and Physiotherapy Suites, Outpatient Doctors’ Offices, Radiology Suites, Intensive Care Unit and Forensics Department with ancillary services. Designed to resist the region’s hurricanes and earthquakes it is set to serve Saint Lucia for a century after construction is completed in July 2013. Upon commissioning the EU will have committed over €40m to a vital project that deepens the partnership with the Caribbean. The alliance extends to businesses, design consultants and contractors given the opportunity to cultivate trust and strong partnerships.